Silver: The silver angelfish sports the coloration of the wild angelfish. It has a silver body with red eyes. Three vertical black stripes adorn the side. These stripes fade or darken depending on the mood of the fish. Veil and Super Veil: The veiltail gene causes all of the finnage to be longer and more flowing. A fish with one veiltail gene is called a veiltail, and one with two has even more elaborate fins and is called a super veil. A veiltail bred to a standard fin will produce half of each type, while a super veil bred to a standard will produce all veiltail offspring. Black and Black Lace: The first color mutation in captivity was the dark gene. A fish with one dark gene is called a black lace. The entire body is darkened, and there is a very attractive lace pattern in the fins. A fish with two dark genes is called a black, double black, or double dark angel and is nearly completely black, though faint barring can be seen in some strains or in the right light. Gold: Gold angelfish have no black markings, and the base color is a yellow-gold. 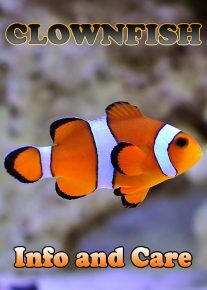 They often have considerable yellow or orange markings on the face, head, and back. 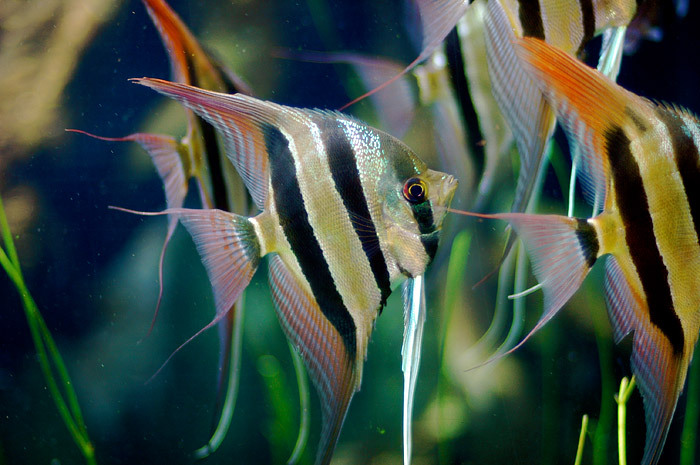 Marble: In marble angelfish the silver and black markings are marbleized rather than in stripes. The fish can be lightly or heavily marbled. Gold Marble: A different gene causes the gold marble coloration, which is a more gold than silver and has only a small amount black marbling compared to a regular marble angelfish. Blushing: The blushing trait removes the dark bars and causes the gill covers to be translucent in young fish. 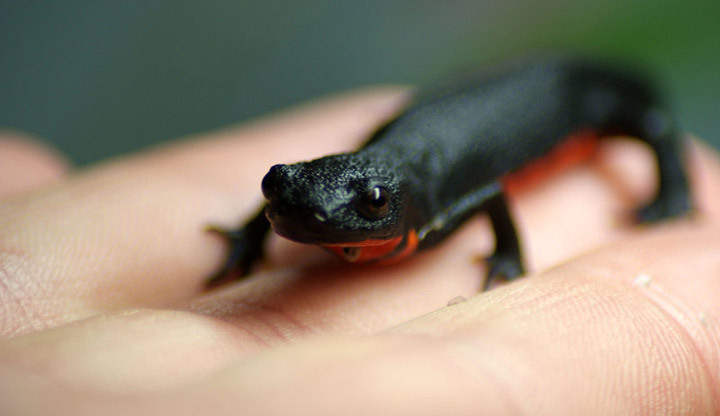 The bright red gills showing through explain the “blushing” name. As the fish mature, their gill covers become opaque, however. A silver blushing is all-over silver with the red “cheeks,” and these often show considerable blue iridescence and are sometimes called blue angels or German blues. A gold blushing is all-over gold with the blushes. 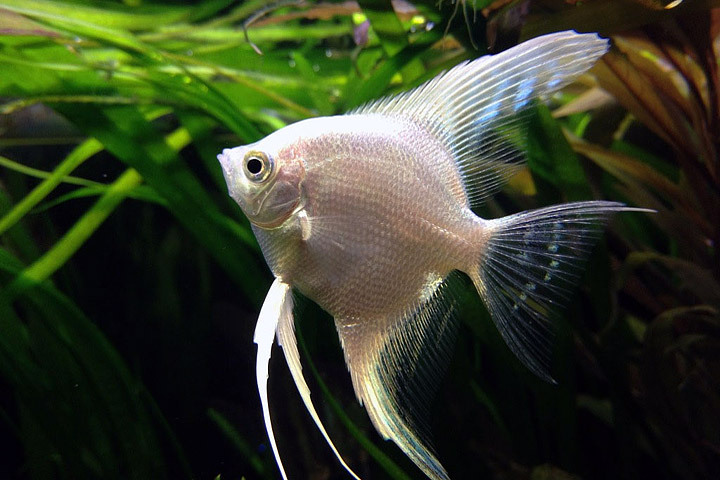 Platinum Angels: The newest mutation in angelfish is the gene known officially as Philippine blue. Identified and established by Ken Kennedy in the Philippines, this trait can combine with other varieties in beautiful ways. A gold angel with two Philippine blue genes is called a platinum and is a spectacular, blue-white fish with amazing iridescence. A black angel with two blue genes is called a pinoy angel, and a gold blushing angel with two blue genes is called a Paraiba. Koi and Sunset: A gold marble blushing is called a koi angelfish. Originally they had red-orange on their heads, but strains have been developed in which the red-orange pigment is displayed on the entire body and into the fins. A gold blushing fish with a prominent orange crown is called a sunset angel. Half-Black: In the half-black angel, the back half of the fish is solid black. The front half is like that of a silver. This trait can be affected by environmental conditions, so fish that are genetically half-blacks can appear as silvers if their rearing conditions were less than ideal. Pearlscale: Pearlscale is a scale mutation and can occur on any color angelfish. It produces a finely crinkled tinfoil appearance to the scales and is much more visible on light fish than on darker ones. Most people prefer, say, an albino pearlscale to a black pearlscale. Albino: Albino angelfish lack dark pigments, but may retain yellow or red pigments. In the right light you will see a white-on-white effect that shows the bars. The eye pupils are pink/red as in all other types of albino animals. Albinos do not produce any dark pigments and therefore show a white to yellow body.